Check website for rides and activities. DuBois Fort Visitor Center and Tours. Thur -Mon 10:30am-4:30pm. Exhibits, public programs, library & archives. Visit the Lodge! It’s a trip, but worth seeing the “other” John Burroughs site & his grave. Free tours of are offered the first weekend of the month, through October, from 11 to 3. Reservations are not needed. Donations towards the upkeep of the Lodge are gratefully accepted. Learn more at our website. Group tours year-round, must be scheduled in advance. Regular hours on website. Noon-3pm and by appointment, Wed, Fri & Sat . Exhibits, reference & local geneaology. Collecting, preserving, and sharing stories of all Purple Heart recipients. This inspiring site should be visited at least once in your life to honor the men and women who served in the name of liberty. Not far from Washington’s HQ in Newburgh and the New Windsor Contonment where his troops stayed. What a great way to spend a day withyour family this year. Go to websites for hour and directions. Speakers programs. 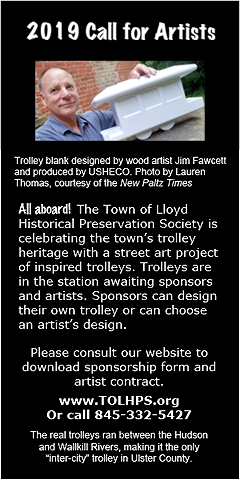 Check website for monthly programs Sept-May, and for special events such as 2016 Hudson River History Cruises in Spring Send your email address to viv@abouttown.us to be included in regular updates on many local history programs for Ulster County. Put “History Buff” in the subject line, please. Call for recorded hours and events.